Because we set-up and take down the inflatable rides, there is no stress for you! 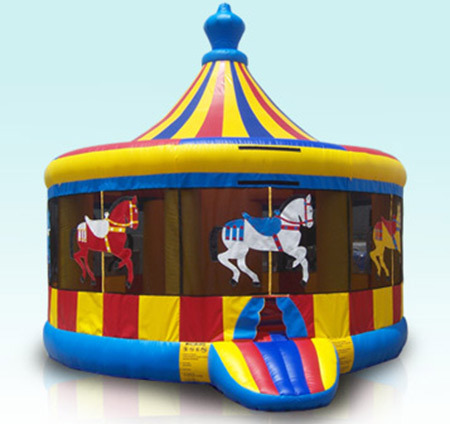 For large events, we will operate the rides. For smaller ones like birthday parties, we will leave you in charge. 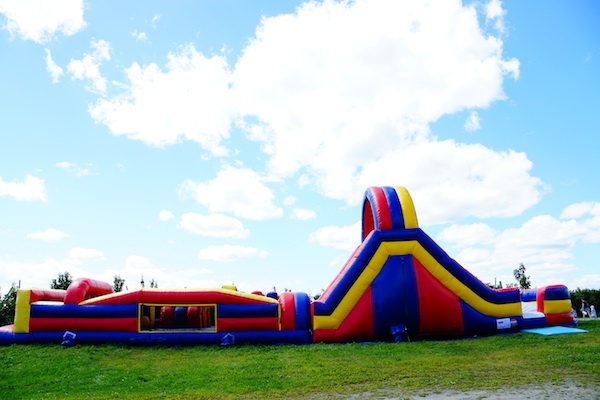 Browse the photo gallery below to see which inflatables you might want or to read the whole description. Can’t decide which rides? We can help. Contact us today! Here is the classic bouncer. Get in it with all your friends. Mom and Dad can bounce too. This unit works great for just about any event. The classic jumper is a whopping 15 feet by fifteen feet. This one brings out the "kid" in adults too. Holds eight to ten people. Fun for all! This colorful beast is a guaranteed eye catcher. 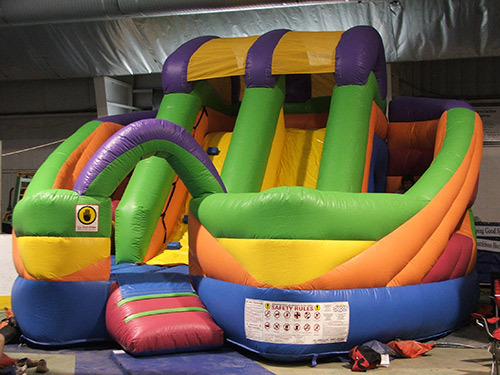 Nine feet high at the head and 55 feet long, it has a built in slide, see-through portals and a other obstacles for pure fun. For kids 90 pounds and under. Climb the ladder on the back deck, slide down onto the front deck and bounce around to your hearts content. Knock down a couple of pirates if they dare to stand in your way. 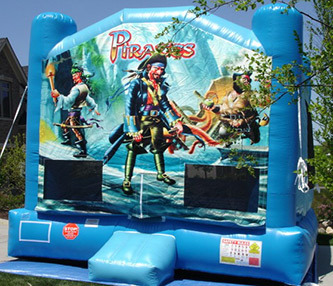 This combination inflatable is the perfect addition for your event if you need something larger than a moonwalk- also comes with an attendant. Here's the toughest race you'll ever run. Through the holes, over the climbing wall, down the slide, in between the obstacles and out the end. Kids can't get enough of this kind of fun. This course is sure to make your event a huge success. This gorgeous green frog is primarily for the little folks. It has a swirling air current inside with balloons riding and bobbing on the wind. Kids can't get enough! This 40' obstacle course is jam packed full of fun. 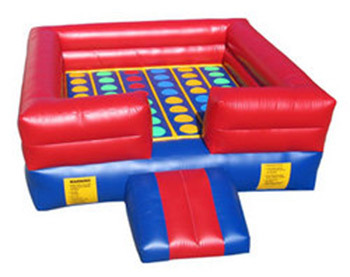 Good for backyard parties and smaller spaces where our 67' obstacle just won't fit. But just as challenging as the big one! Great for schools and large crowds. 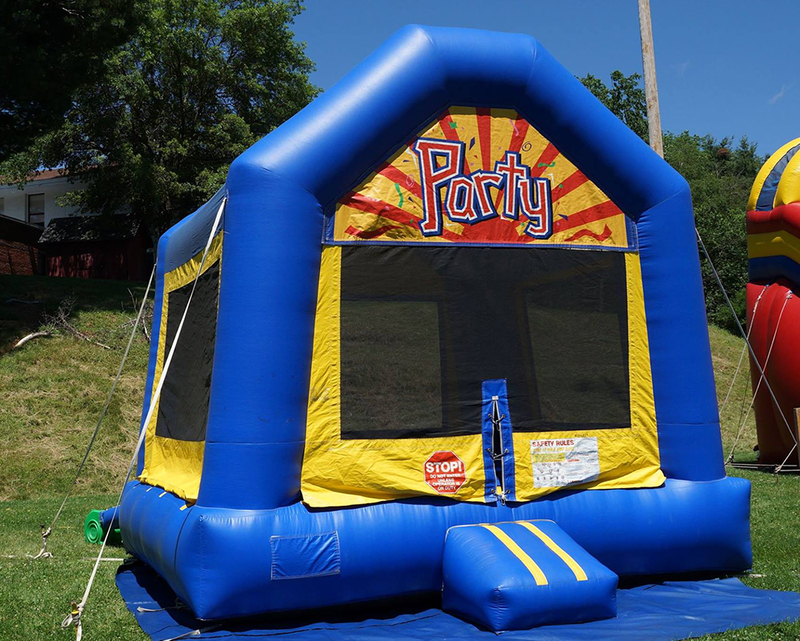 This 4-in-1 combo unit is great for any size crowd or birthday party. 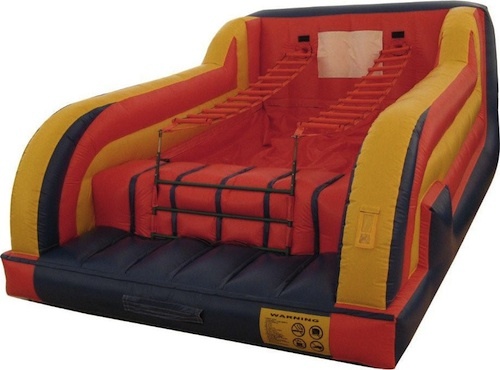 Climb in and bounce or crawl through the tube and emerge into some obstacles. Get past those obstacles and climb the stairs to go down the slide. 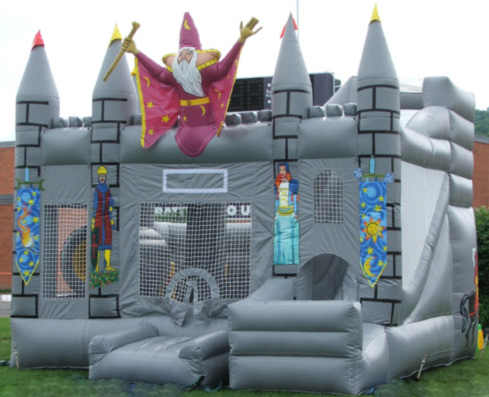 A real thrill for any aspiring wizards, knights, queens and princesses. 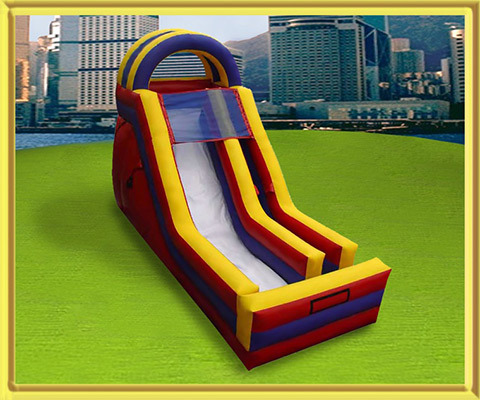 Slide, tunnel, pop ups and a colorful obstacle course for the smaller people in one compact space. Think you're sure footed enough enough to stay on the pedestal and knock your opponent off? 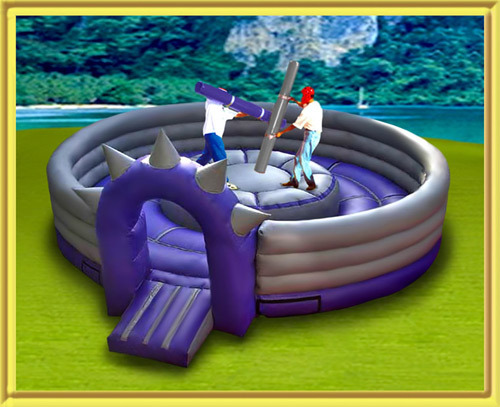 The Gladiator Arena is a sure test of balance, maneuverability, and jousting skills. Great for teens, young folks and adults.Good competitive fun. Have you ever wanted to be a fly on the wall? 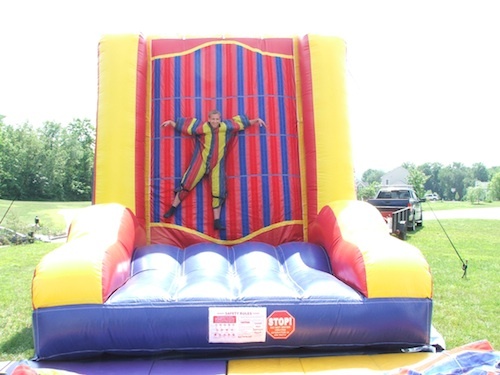 Now you can be with this fun velcro wall. Put on a velcro suit and stick like glue. Adults and kids love it. Great for all types of parties. Suit sizes range from child's medium to adult XL. 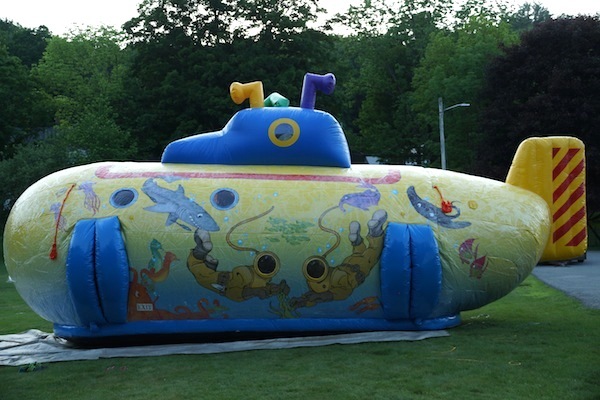 We all love the yellow submarine! Features inside include: starfish, dolphins and seaweed popups, a climb and slide and a friendly purple octopus for the little folks. Kids just can't get enough of this new hit. Great photo op when they look out the dive helmet. Take the challenge of going from one end and back. Challenge your friends. CWorks great for family events, school events and large gatherings. Great fun for all. Can't decide? Obstacle or slide? Well with this one you can have it all. Obstacle course for the first half with a giant slide and climbing wall for the last half. Everyone goes home happy with the one. Just as much fun as the Giant Slide but works in locations where the giant slide just won't fit. 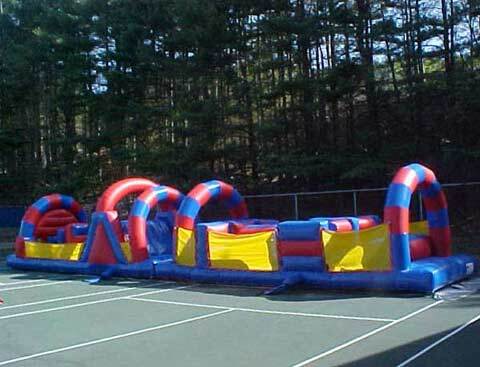 Can be set up in most gymnasiums for indoor events. Great for winter birthday parties when you'd like something different. Can entertain a large number of kids. 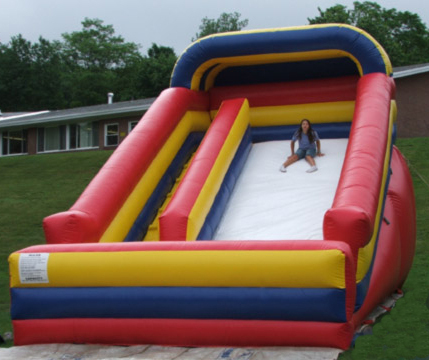 This 18 foot slide is nothing but fun, fun, fun!!! Good for backyards, schools and large events. Fits in most school gyms. Guaranteed to make the day a blast for everyone. 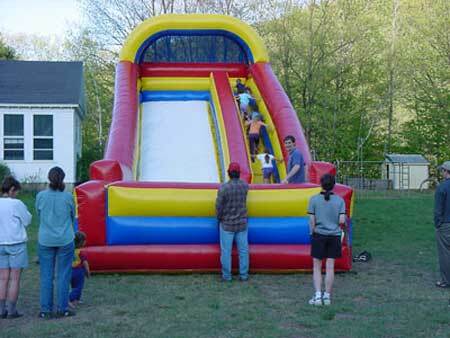 ...and do we ever mean GIANT, at 24 feet high and 30 feet long everyone in the family will have a thrill with this one. 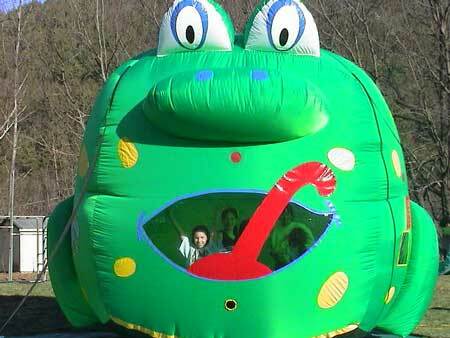 Always the first Inflatable the kids run to! Remember the Carousels at the fair? This colorful bouncer is the perfect addition to any party. It has a center column and a round shape just like the real thing. Left foot on green, right foot on red, left arm on white!!! Think Mom and Dad can still do it? Just as much fun to watch as it is to play. Good for up to 6 players at a time young or old this game is sure to please everyone. Race your opponent down the lane to see who can make it the furthest, or just try to beat your personal best before you get pulled back to the beginning. Great fun and entertainment for all ages.